IC 90 inflator is a new Corghi solution for inflating tires in complete safety, meeting the most stringent standards of ergonomics and safety. 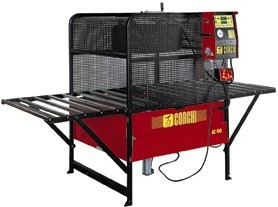 Using exclusive techniques patented by Corghi SpA, the inflator is able to handle all types of wheels from 12" to 20". Solidly constructed IC 90 inflation cage operates with the wheel held in a horizontal position, while the various inflator functions are actuated by the operator from the control console.